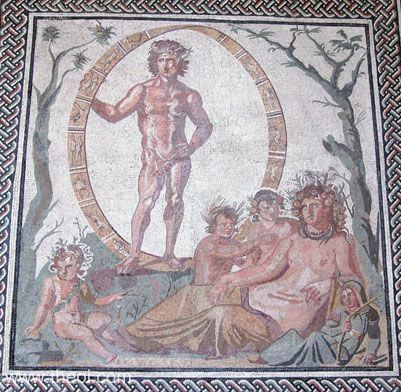 Aeon (Time), Gaea (Earth) and the four Carpi (Fruits) of the seasons are grouped in a familial scene. The god of time stands holding a wheel inscribed with the twelve signs of the zodiac. Gaea (Roman Tellus), crowned with a wreath of fruit, reclines upon the earth. Their four children, the fruits of the seasons, sit beside their mother. They are, from left to right, Eiar (Spring), Theron (Summer), Phthinoporon (Autumn) and Cheimon (Winter).